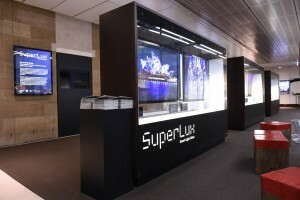 During daylight hours, the SuperLux concept video plays on a large screen at the south (podium) end of the Customs House Atrium, highlighting smart light art triumphs from artists featured in the SuperLux book. Five screens of videos highlight recent triumphs of urban lighting as featured in Davina Jackson’s new book SuperLux: Smart Light Art, Design and Architecture for Cities (Thames & Hudson, 2015). 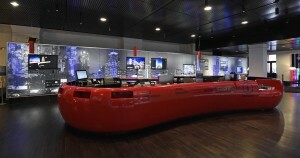 Each video highlights a key genre: Architectural Light, City Screens, Transit Scenes, Metroscapes, and Festivals/Fantasies. 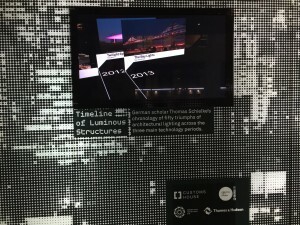 German writer Thomas Schielke’s chronology of notable light architecture spectacles, from early civilization to now. Included are the stained glass windows of La Sainte-Chapelle in Paris (1248), the glazed tiles of the Taj Mahal in Agra (1653), and electric lighting of the Wrigley Building in Chicago (1921) and the De Volharding building in The Hague (1928). 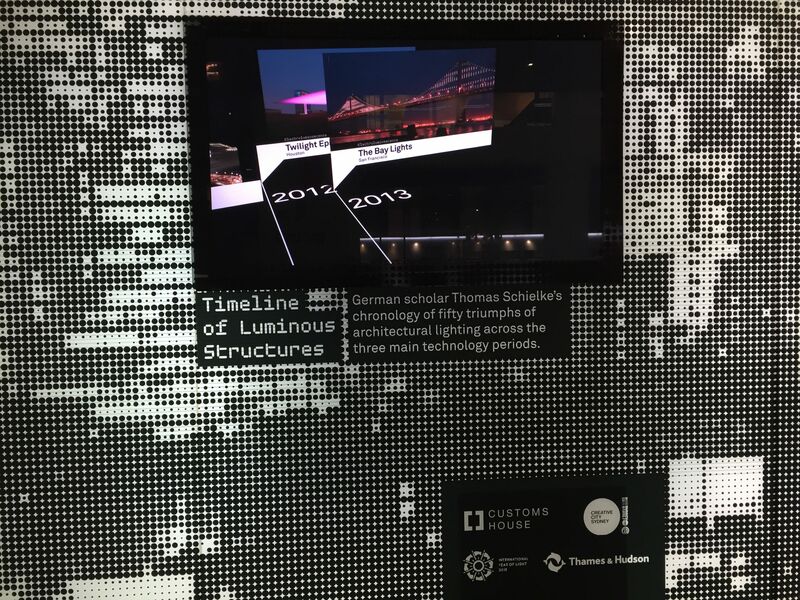 Recent triumphs using electro-luminescent systems include early compact fluorescent lamps dotting the curved Kunsthaus in Graz (2003), the Green Pix facade in Beijing (2008), and the Bay Lights bridge spectacle in San Francisco (2013). 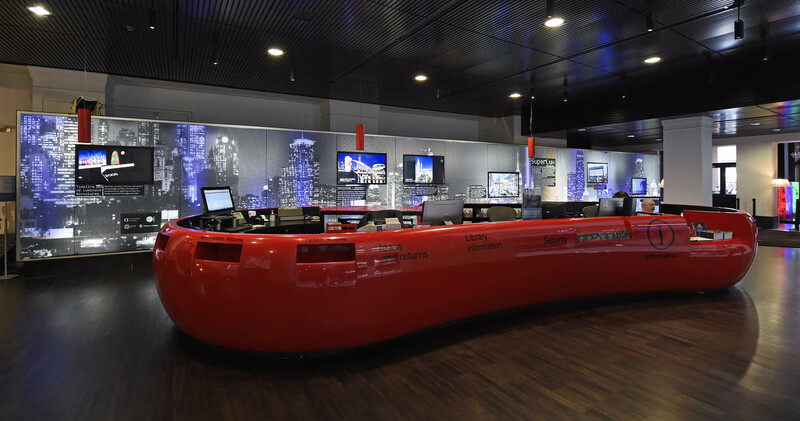 Dramatised images of early electric and recent digital lighting for iconic towers. Included are the Eiffel Tower (1889), the Singer Building in New York (1908), solar-powered, LED-lit towers at Sydney’s Olympic Boulevard (2000), the Agbar Tower in Barcelona (2005), Dexia Tower in Brussels (2006) and 828 metre-high Burj Khalifa in Dubai (2013). 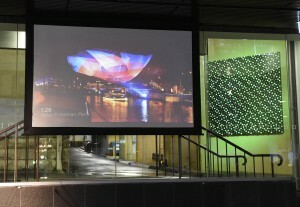 Photographic panels and a video of international performances in the new art genre of 3D architectural projection mapping. Since what in 2000? 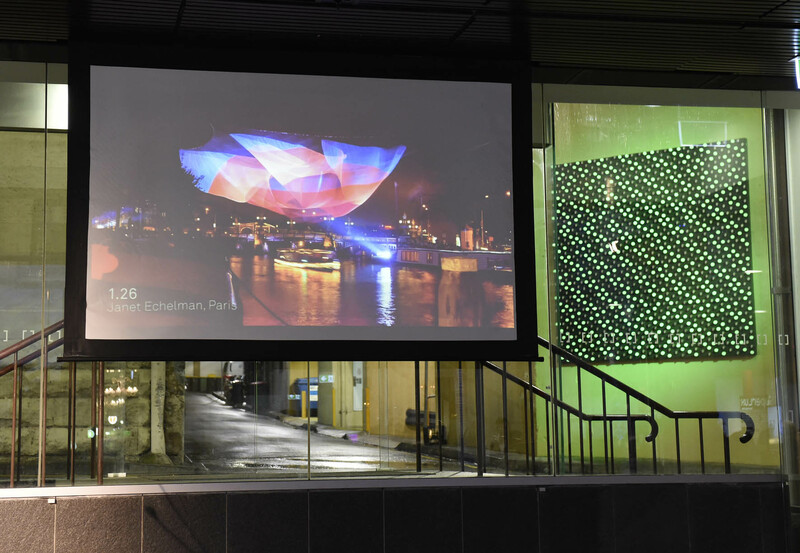 ?, the heritage sandstone facade of Customs House – and its digital model based on 3D laser scans – has been a favourite ‘canvas’ for precisely projected video spectacles by experts including The Electric Canvas and Spinifex.